Major market averages fell roughly 2.5% Friday but not everything went down. 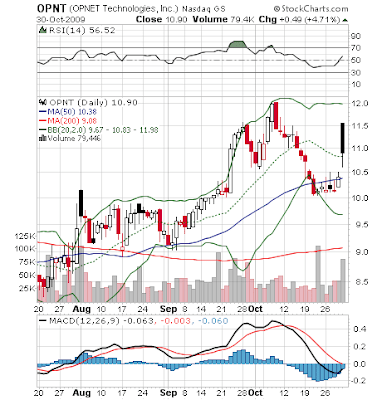 OPNET Technologies (OPNT) gained 4.7% today in the face of relentless selling in most other stocks. What gives? OPNET Technologies, Inc. provides software products and related services for managing networks, servers and applications. The company's products are used to troubleshoot performance problems in production applications and perform capacity planning and design optimization of networks and servers. Products are also used to provide centralized, real-time visibility of network topology, traffic, and status in a single, integrated view and perform modeling of designs and configuration changes. The company also has products that perform some of the same functions but on wireless networks. Finally, OPNET offers consulting and professional services. OPNET is a profitable small-cap that actually pays a dividend, unusual for a tech company of its size. My several measures, it is not inexpensive: PEG is high at 3.61 and the 12 month trailing PE of 63 is definitely at nosebleed levels. Given the economic backdrop, it's not surprising that trends in revenue and earnings have been lackluster. The company actually suffered losses in the first two quarters of 2009. On Thursday after the close, however, OPNET reported results for the third quarter of calendar year 2009 (which, if you're interested, is equivalent to the second quarter of their fiscal year 2010). The company recorded earnings per share of $0.09 which soundly trounced analyst expectations of $0.03. Revenue for the quarter was $30.6 million, which compares favorably to the estimate of $28.69 million. Software license revenue grew 30.9%, or $2.8 million over last quarter, and operating margin went from negative 2.3% to positive 7.2% over the last quarter. The company also ended the quarter with record deferred revenue of $34.9 million. Though the year-over-year revenue comparison was negative, the solid profit was enough to fire up investors. The chart below shows Friday's nice up-move on strong volume. The stock was on the TradeRadar Swing Signals list as a BUY on Thursday night. I wish I could say all the Swing Signals worked out as well as this one. Despite a stronger than expected quarter, management remains cautious. OPNET sees Q3 revenues of $30.5-$32.5 million, versus the consensus of $30.3 million. They see Q3 EPS of $0.03-$0.09, versus the consensus of $0.06. The CEO claims to be seeing more normal buying patterns after the previous year where deals dried up or were yanked at the last minute. The company seems resilient and responsive to changes in the industry and committed to growth through innovation. As an example, with virtualization an increasingly important strategy for more and more corporations, OPNET has introduced a product for troubleshooting application performance problems in virtualized environments. For those who like to see management put their money where their mouth is, fully 36% of shares are owned by insiders. Though a player in infrastructure performance management (IPM), the company's primary strength is in application performance management (APM) which, as it turns out, is not the strong suit of their biggest competitors (all known by their initials) BMC, CA, HP and IBM. The other competitors are mostly on the same level as OPNET or even smaller so OPNET still has wide open opportunity to grow market share. The company could even be a buy-out target as one of the big four look to shore up their APM product suite. As networks and applications grow in complexity, OPNET is there to offer tools that more efficiently identify root causes and potential solutions. As customers routinely seek fast performance and 24/7 availability, OPNET's products provide the ability to monitor in real-time and troubleshoot quickly. Despite a tough environment OPNET has managed to deliver bottom-line growth. In an improving economy they should do even better. When the current market correction has run its course, OPNET could add to gains.